Israel's Security Cabinet early Tuesday approved widening the ground offensive in Lebanon, a participant said, and rejected a cease-fire until an international force is in place. The Israelis hope with a more aggressive push that by Thursday they will have destroyed all Hezbollah positions in southern Lebanon, CBS News correspondent Sharyn Alfonsi reports. Thousands of army reserves have been called up in recent days in advance of the decision, which is expected to lead to sending more troops into the border area. Israeli leaders have said they want to carve out a zone about 1 mile wide that would be free of Hezbollah emplacements. During the day, Lebanese fled north in overflowing trucks and cars, taking advantage of a lull in Israeli bombardment. Israel's prime minister took a tough line, apologizing for the deaths of dozens of Lebanese civilians in a single strike but declaring there will be no cease-fire. CBS News correspondent Lee Cowan reports that Qana, the site of the strike, has become a rallying cry — one that's done more for Hezbollah's cause than anything else since the war began. "The Lebanese people were split," one man in Qana told CBS News. "But after the Israeli massacre in Qana, we are all behind Hezbollah now." Israeli forces have been operating in two segments of south Lebanon, sweeping through villages, fighting Hezbollah gunmen and leaving considerable destruction behind. The participant, speaking on condition of anonymity because he was not authorized to talk to reporters, said Israel's air strikes in Lebanon would resume "in full force" after the 48-hour suspension expires in another day. Israel agreed to the suspension, which began early Monday, in the wake of its bombing of a building in Qana, which killed killing dozens of civilians, most of them women and children. But if the conflict is any closer to an end, there are few signs of it on the front lines, Alfonsi reports. In Israel, more tanks and troops are being pushed further into the Lebanon border. However, the Security Cabinet, a decision-making body made up of senior ministers, decided to resume the offensive and broaden ground operations. The participant said the international force must have the ability to intervene with force if necessary to keep Hezbollah guerrillas from returning to the border area. He said there was no deadline for the Israeli offensive, though the United Nations Security Council is expected to debate a resolution this week about a cease-fire. At least one Republican is breaking ranks with the White House over the Mideast. Nebraska Sen. Chuck Hagel, R-Neb., says America's image in the region is suffering. Hagel calls the fighting between Israel and Hezbollah "sickening slaughter." He says both sides need to stop now. Hagel also says Israel's pounding of Lebanon is hurting America's image in the Middle East. The attack that killed dozens of Lebanese civilians in Qana is resonating in Iraq, with protestors carrying coffins symbolizing dead Lebanese children, Cowan reports. Sunnis and Shiites, who usually can't agree about anything, are finding common ground in support for Hezbollah. Syrian President Bashar Assad called on his army Monday to increase readiness to cope with "regional challenges." Travelers from Syria have reported that some reservists have been called up for military duty — a sign that Syria is concerned the fighting in Lebanon could spill over. Secretary of State Condoleezza Rice said Monday that Israel's attack on Qana complicated her diplomatic push in the Middle East. She acknowledged that there is "a lot of work to do" to bring about a lasting cease-fire. Haifa returned to life after Israel's suspension of air strikes in Lebanon, reports CBS News correspondent Robert Berger (audio). However, police were on high alert, sealing off streets and setting up roadblocks for fear of a suicide bombing attempt. At least 524 people have been killed in Lebanon since the fighting began, according to the Health Ministry. Fifty-one Israelis have died, including 33 soldiers and 18 civilians who died in rocket attacks. Israeli warplanes hit Hezbollah fighters battling with soldiers near the border as the guerrillas fired mortars into Israel. The clashes signaled that the violence was not over, even though an Israeli suspension of most air strikes in Lebanon — and a pause by the guerrillas on rocket attacks in northern Israel — brought both countries their quietest day since the conflict began three weeks ago. Some 200 people — mostly elderly — escaped the Lebanese border town of Bint Jbail, where Israeli troops and Hezbollah guerrillas fought their bloodiest clashes. Two residents dropped dead on the road out, one of malnutrition, the other of heart failure. Some survivors described living on a piece of candy a day and dirty water as the fighting raged. "All the time I thought of death," said Rimah Bazzi, an American visiting from Dearborn, Mich., who spent weeks hiding with her three children and mother in the house of a local doctor. The lull was felt across northern Israel, too: In the town of Nahariya, residents who had been hiding in shelters for the better part of three weeks began emerging. Supermarkets were fuller than before and more people were in the streets, walking along the beach and shopping. Israeli Prime Minister Ehud Olmert apologized for the civilian deaths in Saturday's strike, in which 56 people, mostly women and children, were killed. "I am sorry from the bottom of my heart for all deaths of children or women in Qana," he said. "We did not search them out. ... They were not our enemies and we did not look for them." But he insisted Israel had no choice but to fight. "There is no cease-fire, there will be no cease-fire," he said. "We are determined to succeed in this struggle. We will not give up on our goal to live a life free of terror." Near the fighting, grass fires set by shelling blazed into the night sky from the hills outside the Lebanese border town of Marjayoun. U.N. peacekeepers struggled to get trucks full of aid supplies across the Litani River as artillery pounded only a few hills away. President Bush resisted calls for an immediate halt to fighting, underlining that any peace deal must ensure that Hezbollah is crippled. He said Iran and Syria must stop backing the Shiite militant group with money and weapons. "The Security Council postponed the planned session on troop contributions for an international force in Lebanon, first for a day, and now indefinitely, pending Secretary of State Rice's proposed package that will be presented this week or next," said CBS News foreign affairs analyst Pamela Falk at the United Nations. "Without some sense of a cessation of the violence, the fear is that any international force will be caught in the crossfire." The European Union said Monday it is confident the Security Council will be able to reach a decision on a cease-fire in southern Lebanon this week. "As we work with friends and allies, it's important to remember this crisis began with Hezbollah's unprovoked attacks against Israel. 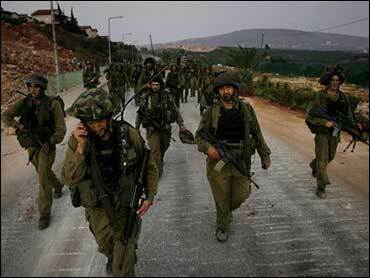 Israel is exercising its right to defend itself," Mr. Bush said. Rice said earlier in the day that she expected a U.N. resolution for a cease-fire within a week. But as she headed to Washington after a visit to Jerusalem derailed by the Qana strike, she struck a more pessimistic tone. "There's a lot of work to do," she told reporters. "You have to get all the work done, you have to get it done urgently." The central focus for a peace deal has been the deployment of a U.N.-mandated international force in southern Lebanon to ensure guerrillas do not attack Israel. But details of the force still must be worked out. With talks continuing, the U.N. postponed a Monday gathering meant to sound out contributions to a force.